Here is my Boy's Day card for this year. I made it a 5-1/2" square stand up card because my intent is to send one to each of my sons for them to display on their desks. Where they are living now there may not be too many people who celebrate this occasion which is a Japanese tradition. On the fifth day of the fifth month (May 5th) each household is supposed to display flying carp decorations in front of their house to indicate the number of males who reside in the home. 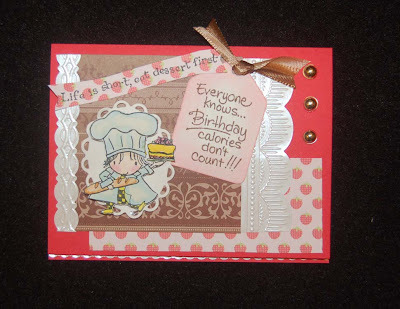 As you can see I've made five cards with my favorite sayings stamped on them. These are to be interchanged and attached to the frog clip (purchased possibly from Ben Franklin Crafts awhile ago, similar ones can most likely be found at an office supply store or made by gluing a shankless button to a mini clothespin). The frog clip serves the dual purpose of being a holder for the sayings or any other message/reminder and for holding the card in an upright position. With the card closed you can see the details better. 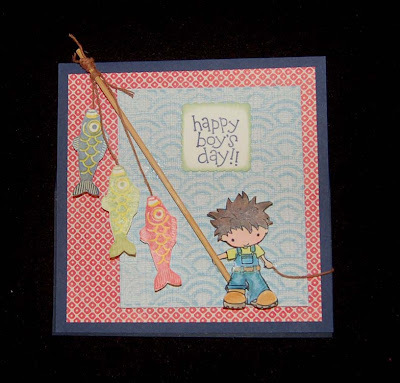 The boy character is a Stamping Bella rubber stamp called 'Catch of the Day' which can be purchased at Ben Franklin Crafts. I cut off the fishing pole and bucket that the boy was carrying. (Although I do have other stamps with images of Japanese boys in yukatas, I thought the hair of this child really reminded me of my younger son's toddler hairstyle.) 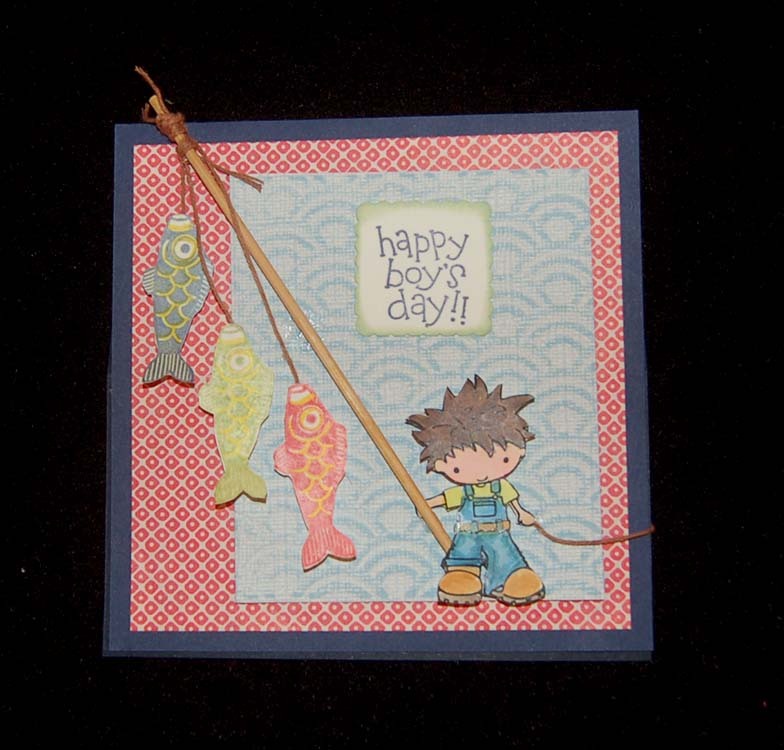 The fish image and words are Dandelion Design stamps which are also available at Ben Franklin Crafts. The 'bamboo' pole is a piece of a wooden skewer and the 'rope' is Martha Stewart twine. The red printed paper is from a pack of origami sheets and the embossed paper was made with a Sizzix embossing folder on paper from the 'Whitewash' paper pad. The paper was sanded after embossing to highlight the design which to me has an Asian water or fish scale look ....perfect for this card! As you can see from the photo of the back of the card a nice pocket is formed when you tape the sides and bottom half of the card front to the card base. 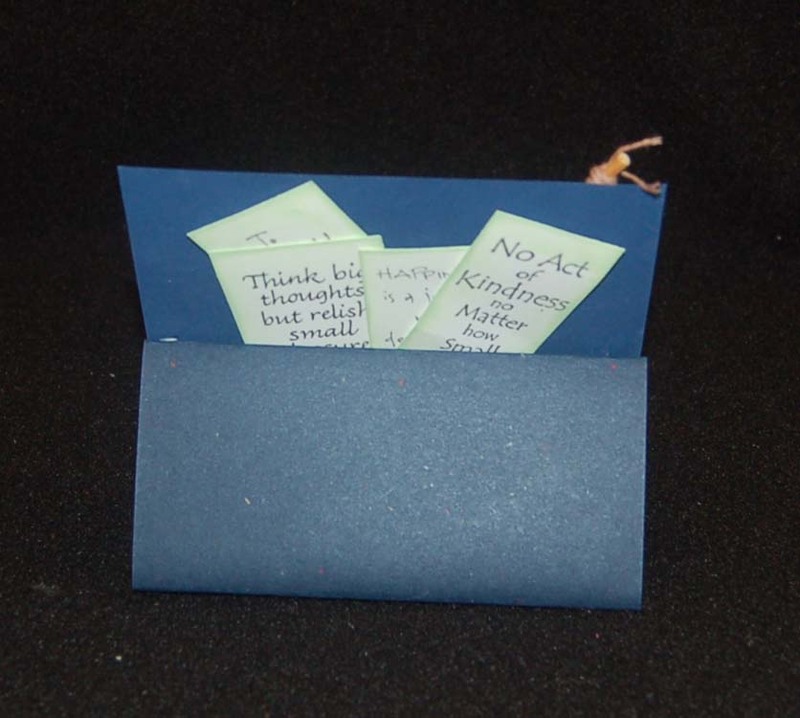 The bottom photo shows how the front of the card base is folded in half and only the bottom half of the card front is taped down. Fabri-Tac is the strong quick drying glue which was used to adhere the frog clip and bamboo pole. I enjoyed making this card and I am pleased with the outcome. Hopefully this project will give you some ideas for your future creations. Thank you for visiting and have a Happy Boy's Day! Just a quick post to show you the 12 x12 paper pack that I am currently loving. It's called Whitewash and is filled with muted pastel textured sheets with white cores. This means the paper can be dry embossed (I like to use embossing folders) and sanded lightly to reveal a darker tone underneath. 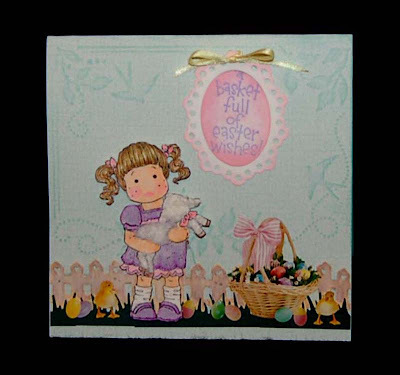 I used this paper as the base for my Magnolia Easter card. To coordinate with this Whitewash pad, I bought a DCWV card sized pack called Linen Closet. I love the soft summery prints in this collection. It also comes in larger size pads. 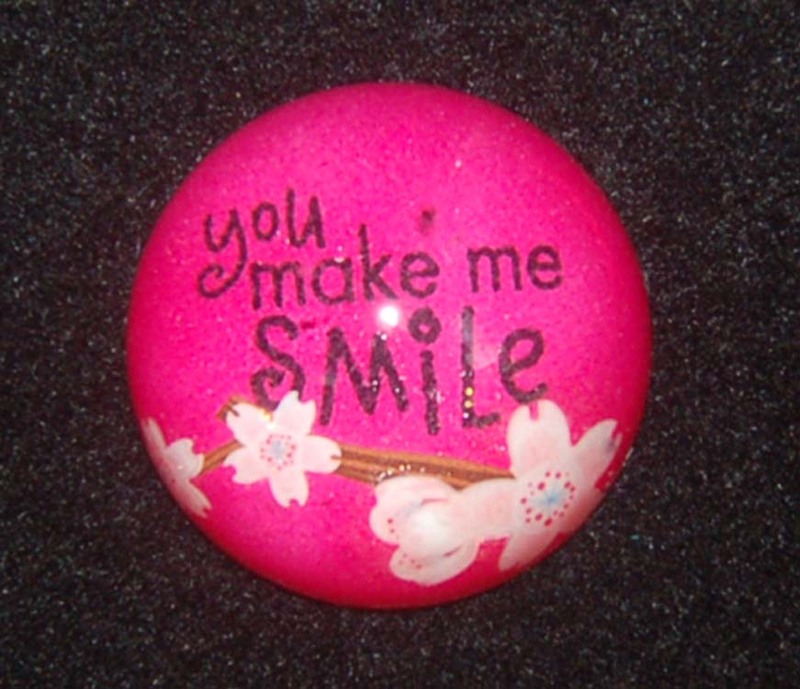 The bling that I am featuring in this post is something new from Ben Franklin Crafts. 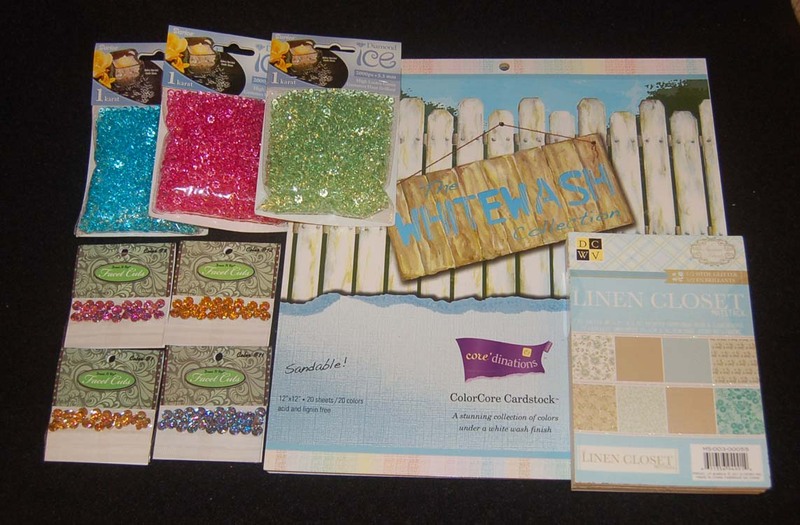 One product is called 'Diamond Ice' and each of the assorted color packages contains hundreds of tiny faceted acrylic pieces that can be used for adding color and sparkle to flower arrangements in clear glass vases and are equally useful for papercrafting bling. 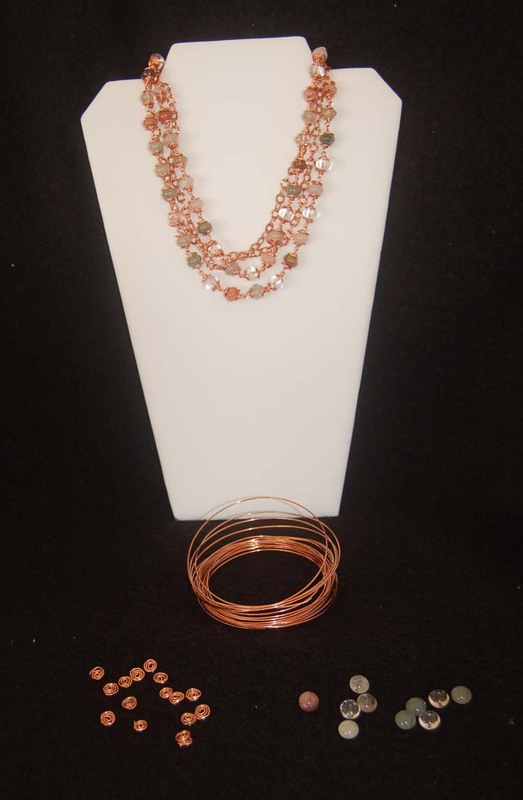 The smaller packages of acrylic gemstones shown in this photo are from Dress It Up and differ from other acrylic gemstones because they have two colors that shift within each acrylic piece. Although you cannot see this effect from the photo, I think crafters will find this product appealing and priced right. Now that the Easter holiday is over, I'm sure that you will want to move on to Boy's Day and Mother's Day projects. I will be working on mine and blogging about them soon. Be sure to check out the new products arriving at Ben Franklin Crafts and pick up some clearance sale bargains while you are there. Happy shopping and crafting! If you are a regular visitor to this site, thank you for stopping by again and please do leave a comment if you have the time. I love hearing from you. If you are a new visitor, thank you for your interest and I hope you will visit again soon. Please feel free to leave a comment too! As promised, here is are photos of the paperweight that I made at the Market City make-n-take taught by Chris during the relief collection for Japan. Thank you to all who supported the event. The original paperweight for the make-it-take-it project had cherry blossom stickers or fish ones (for the boys) but I wanted to add a name before sealing the bottom. However, I couldn't find the right letters and I have bad handwriting so I ended up just stamping a saying with black Memento ink. Sadly, you can see there is a stray black mark which turned up after the Judikin's Diamond Glaze dimensional sealant dried. I didn't notice that there was an ink mark in the back of the pink paper and the sealant made it soak through and show on the other side. Oh well, I'll check better next time. This project would make a great Mother's Day gift with stickers and perhaps a photo. Dads, this is so easy I'm sure you can help your children make this. 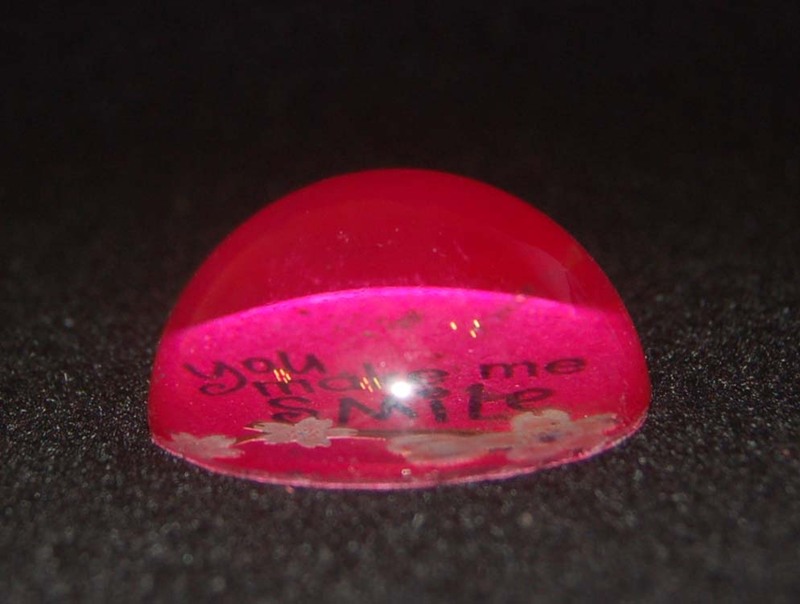 The blank glass paperweight, stickers and dimensional sealant (Sakura's Crystal Lacquer is another brand) are all available at Ben Franklin Crafts. All you need to do is place a few stickers, dried flowers, photo, etc. on a plain paper circle slightly larger than the base of the paperweight. When you are satisfied with the arrangement adhere it all down with the sealant and apply a thick coat before topping it with the glass dome. Press to get most of the air bubbles out (some are okay and will give the paperweight a vintage look). Once the sealant is dry, cut off the excess paper and cover the bottom of the paper weight with a felt circle if desired. I hope you'll give this project a try. It's really easy to do and can turn something ordinary into something very personal. Isn't that why we craft? 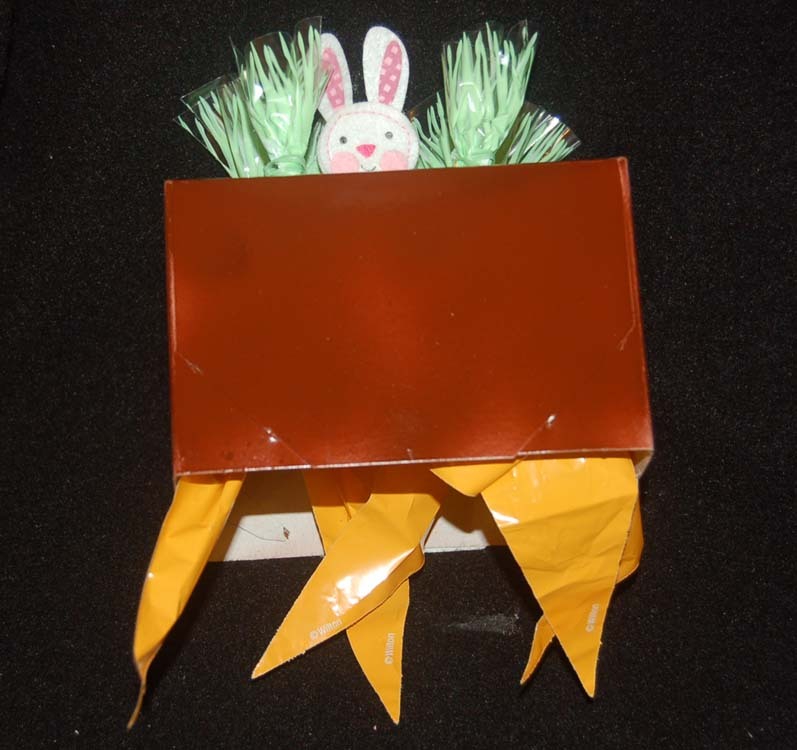 Happy Easter to all of you in blogland! This virtual Magnolia card is what I'm sending to all of you for being faithful visitors to my blog site. Using a Magnolia image is new to me. 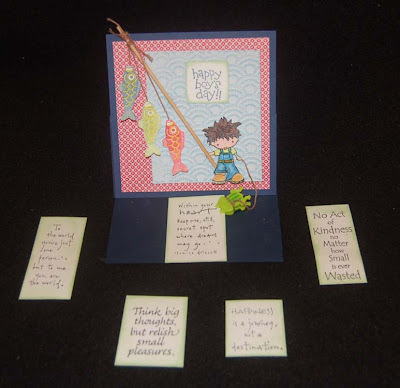 Recently, I admired Shirley's work(Stampin for the Fun of It) and she generously shared some digital images and die cut fences. Isn't she a sweetheart? Now I've started collecting Magnolia stamps. The lack of a mouth on the Magnolia images always bothers me so as you can see I drew one in. I wanted the tentative smile to capture the look that children have when they are not quite sure they like what they are doing......for example, holding a lamb. I like to believe that the artist who illustrates the Magnolia kids leaves out the mouths so we can draw or imagine them. 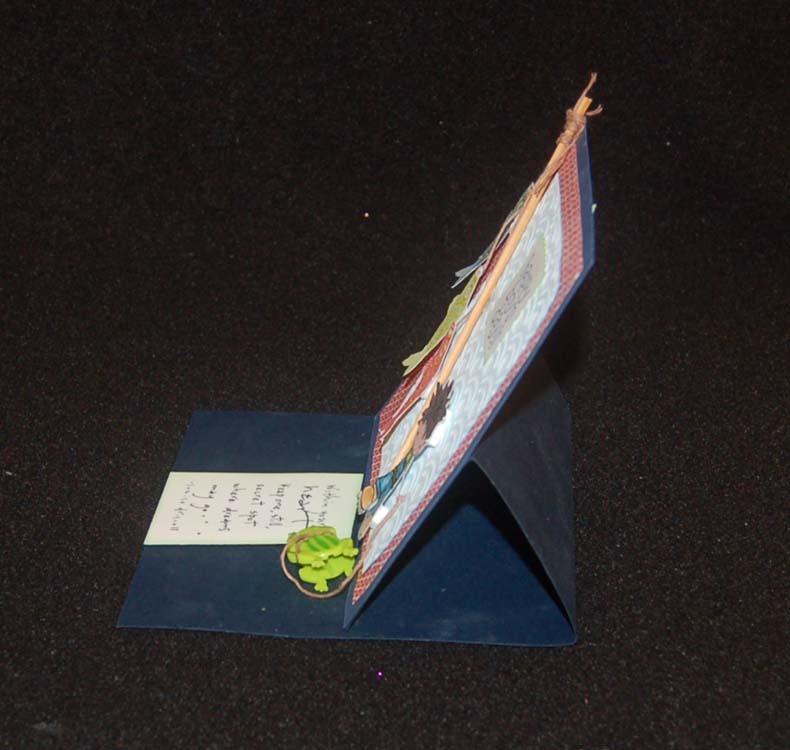 The card base was made from a textured cardstock with a white core ( see next post for info) that was embossed with a Sizzix folder from Ben Franklin Crafts. I just love the birds and the fact that on this embossing folder there is space for journaling or decorating rather than the usual all over design of most embossing folders. I sanded the card base to bring up the design but you still can't see it well in the photo....sorry. The stamped sentiment is a Dandelion Design stamp. I used a combination of white Fun Flock and Flower Soft for the lamb fur. 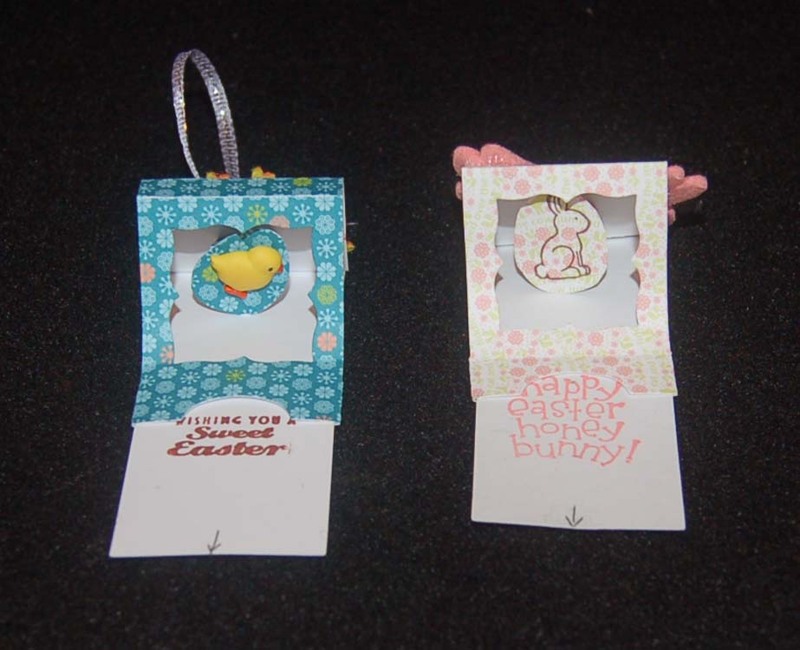 I couldn't find a basket die cut or stamp of the correct size so I ended up using a Mrs. Grossman sticker for the basket, eggs, and chicks. The grass is a Martha Stewart punched border. Okay, that's it for now. I'm off to my favorite craft store (BFC) to buy some supplies for my next project and more storage bins, LOL! I hope you have a terrific Easter weekend! When my oldest son was four years old, I found a recipe for biscotti dough that could easily be shaped into cookies by kids. 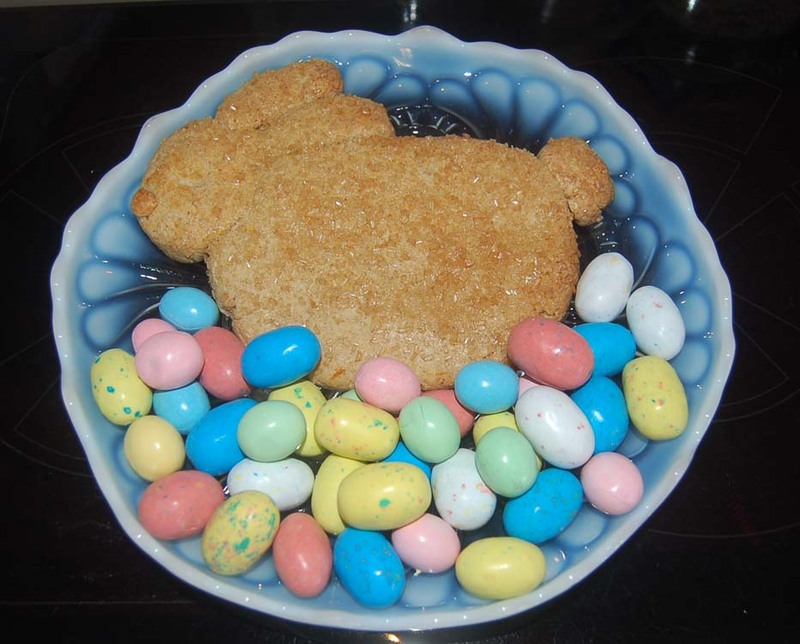 It was a hit and for many years making biscotti bunny cookies was an Easter tradition in our family. This year because we are trying to be more healthy, I made the cookies with whole wheat pastry flour. I do hope that you will give this recipe a try and encourage your kids to have fun. Please refrain yourself from reshaping the cookies even if they may not look bunny-like. LOL! Enjoy your bunnies (especially the human ones). Separate one of the eggs and save the white for the glaze. Beat the 3 egg yolks and 2 egg whites with the sugar until thick and pale yellow. Beat in the melted butter. Add in the vanilla and orange peel. Mix in flour and baking powder. Divide the dough into 3 balls. On parchment paper form three bunnies brushing a little egg white between the joints to make the pieces hold together. Keep the cookies about 1/2" thick and decorate with a wash of egg white and a sprinkling of coarse sugar. Mini chocolate chips or raisins can be used for eyes if desired. Bake at 350 degrees F. for 20-25 minutes. Cool the biscotti bunnies on a rack. What the **** is this weird box? Ha-ha-ha (Of course I meant 'heck' but you can fill in the * ***with any letters you want.) I just posted this photo to show you the base of the treat box. It is just a regular gift box about 6"x 6"x 4"(high) that was sprayed brown. Probably a less shiny box or matte spray would make it look more like soil. I marked six 1-1/2" circles on the cover and cut slits radiating from the center. I also cut a small finger sized hole for the rabbit finger pupper (Darice Fuzzies). 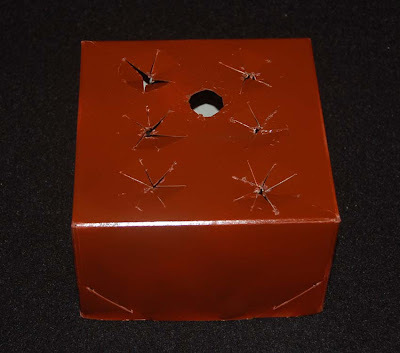 (The holes were cut before spraying.) The second and third photos show the finished project. 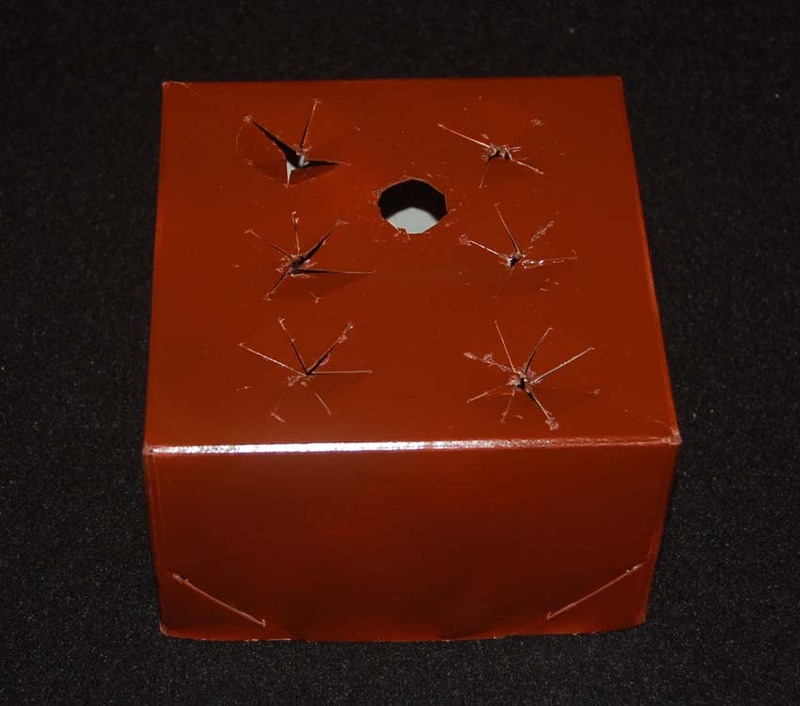 You can see why the holes had to be cut oddly to hold the carrot shaped treat bags (Wilton) for filling. The green twisty ties came with the bags. You could probably design a box with just a couple of carrot bags if you didn't want to give a sugar overload. 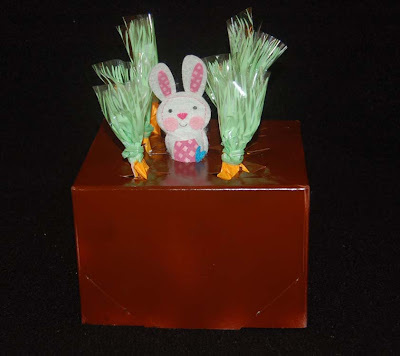 Instead of spraying the box you might prefer to paint the surface with an acrylic paint or glue on brown paper. To dress up the project you might want to attach a Happy Easter label, some punched grass borders, or a paper garden fence. Okay, gotta go and buy some candy to fill the bags and mail off the treat box. Hope you'll visit this site again soon! Hooray! 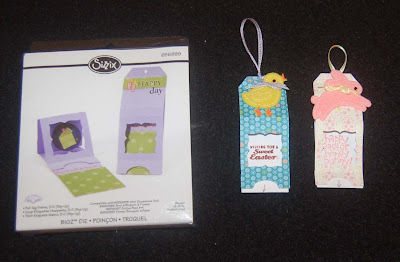 The Stella Bella stamps are at Ben Franklin Crafts. I couldn't wait to ink up my favorite Stella Bella purchase, the little chef stamp. However, I learned that the stamps have to first be adhered to a special foam sheet before I could use them with acrylic blocks. The Mapunapuna Ben Franklin Crafts has the EZ mounts near the Bella stamps and the other stores should have them in shortly. A non-stick scissors (like Fiskars) is recommended for cutting the foam sheets. Anyway, here is my first attempt with the chef stamp. I cut off his wings because he is actually a bug chef and I wanted a regular one. To give the card a pastry look I used paper from the DCWV Sweet stack and Martha Stewart border stickers, which look like frosting. I even put a border sticker inside the card......see it peeking out at the bottom. The sayings stamps are two of my favorite ones from Stampendous and All Night Media. I think I will go back and add some glitter or Stickles to the cake. I'm excited to use more of the Stella Bella stamps in my future projects. Hope you'll visit again to see what I'm crafting. 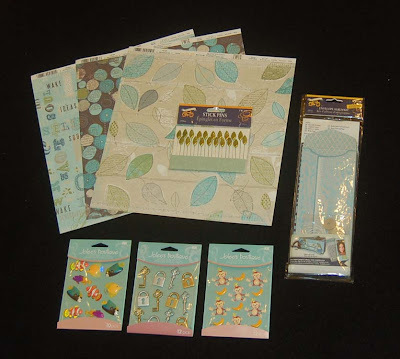 A few days ago I was in Honolulu and did some fun shopping at Ben Franklin Crafts. I visited both the Mapunapuna store and the one in Market City. Here are some Bo Bunny products I purchased because they were 'boy' designs. Maybe now I will get around to scrapbooking all the boxes of photos and memorbilia I've collected over the years. I've promised to get going on the albums before my memory gets going, going, gone. LOL! 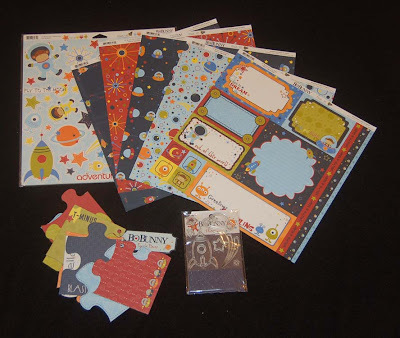 There are lots of other Bo Bunny products in this design line but I thought I'd start with the papers, die cuts, puzzle pieces, and clear stamps. The next photo is of some Little Yellow Bicycle products (also from BFC). I really like the muted blue and green tones of these items. Besides the papers, I love the unique envelope album and leaf stick pins. At the bottom of the photo are some new Jolee's hard plastic stickers. There were so many more designs but I restrained myself and got just my favorite three. I may go back and buy more (wink, wink)....you know I will. These stickers are like buttons with the shanks cut off and adhesive on the back. I hope I've made you feel like shopping. Thank you to all of you who did shop last Saturday to help send relief money to Japan. I'll show you (in a following post) one of the make-it take-it projects I made from that event. Thanks for visiting. I had a bit of trouble with this pop-up tag die because it was missing the instructions. Maybe I'm just paper construction challenged. It took me awhile but if I could figure it out w/out instructions you will sure be able to do it. LOL! I'm sure that it really does have instructions. Anyway, I enjoyed making these cute tags because I love movable paper parts. The felt animals are Darice Felties which come in large packs and are very inexpensive at Ben Franklin Crafts. The 'Sweet Easter' words were stamped using a Studio G acrylic cling ($1.25) and the other words were made with a Dandelion Design wooden handled stamp. I cut the pop-up Easter eggs by hand and stamped one with a DD small rabbit stamp. The plastic chick is a button (Jesse James) with the shank cut off. I really love this Sizzix die because it's a fun way to add a handcrafted touch to a gift when you don't have the time to make an elaborate card. Enjoy the weekend and craft something that will give someone a smile! 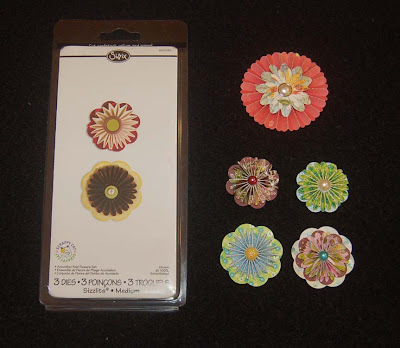 Remember the Tim Holtz rosette die I told you about a few posts ago? Well, I wanted to show you the cute smaller Sizzlet rosette die I just purchased from Ben Franklin Crafts. In the photo the large orange rosette is the Tim Holtz one, which is useful for card making as well as gift wrapping bows. I made the other four small rosettes using the Sizzlet die. The die has two accordian strips, three flower bases, and two centers. Even though it is a Sizzlet die I was able to cut three accordian strips of paper at a time. (You will need three strips per rosette.) Because the Sizzlet die parts are small, you can use up all your tiny scraps even those long useless edge pieces. Also the smaller rosettes fit nicely on the larger ones so with the two dies you can make dozens of combinations. Have a craft happy day! Thanks for visiting. I love jewelry that can be worn in more than one way and match several outfits in my wardrobe. 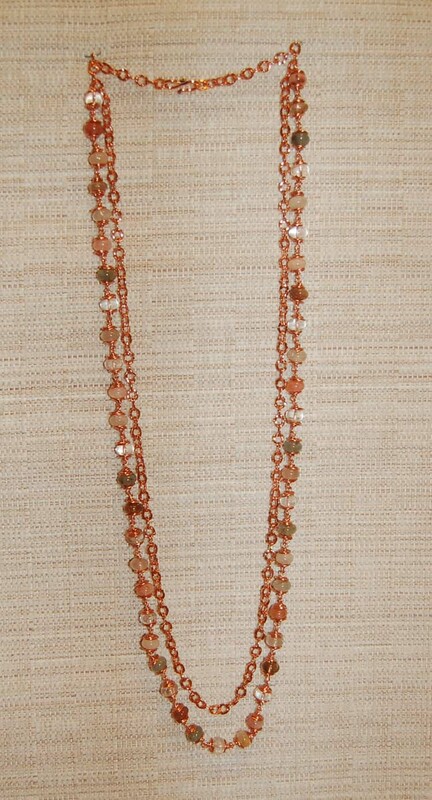 Necklaces like this one fit the criteria and that means it makes a good piece to take on a trip. 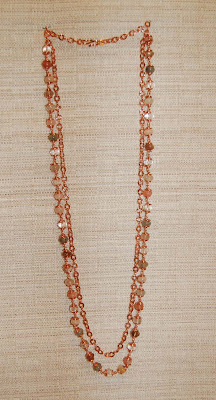 I got the idea for the project from a tumbled gemstone necklace I bought from a department store clearance table. (The regular price was outrageous!) Sometimes it's worth it to buy a piece for inspiration and measurements. (Especially if it's on sale!) Anyway, I'm always attracted to multi-colored rutilated quartz so when I found a strand of roundells, I knew I could use it for this project. I tried to find spiral copper bead caps but was unsuccessful so I fabricated them myself. (See second photo.) It took a long time but was mindless work done in front of the TV. Two coils of 20 gauge copper wire and a copper S hook (plus the beads) was all it took to make this entire 34" necklace. New beads should be arriving shortly at Ben Franklin Crafts (maybe there already) so look for a 16" strand roundell bead strand that pleases you and try out this project. Thank you for being a visitor to this blog site.